Pete (Mark Wahlberg) and Ellie (Rose Byrne) Wagner are speculators who make a living flipping real estate in their hometown of Atlanta. The couple’s latest acquisition is a fixer-upper with five bedrooms that they hope to sell to Ellie’s sister Kim (Allyn Rachel) and brother-in-law Russ (Tom Segura). However, Kim and Russ aren’t in the market for a house that needs so much work. Furthermore, they’re childless with no plans to start a family. So, they simply have no use for a place that large. Pete and Ellie don’t have kids either, but they have been seriously considering adoption. In fact, they’ve even been checking out photos of available children online. Next thing you know, they’re visiting a foster care facility during an adoption fair run by administrators Karen (Octavia Spencer) and Sharon (Tig Notaro). While being escorted around the grounds, Pete hits it off with Lizzy (Isabela Moner), a headstrong 15-year-old in need of a father figure. The trouble is, Lizzy has been serving as a surrogate mother to her little brother (Gustavo Quiroz) and sister (Julianna Gamiz), and she doesn’t want to be separated from her siblings. Do the Wagners have enough love in their hearts to adopt all three? Of course they do, and the ensuing adjustment to parenthood is the sum and substance of Instant Family, an inspirational biopic co-written and directed by Sean Anders. The semi-autobiographical adventure is based on Anders’ own real-life experience. 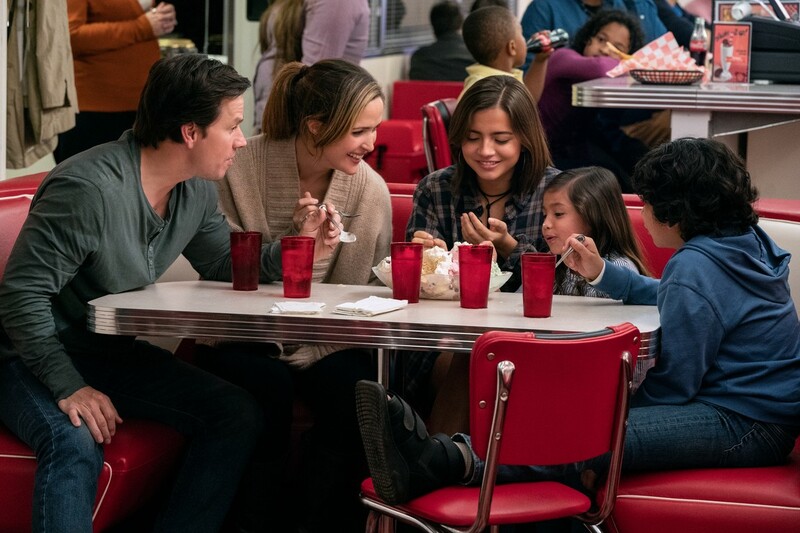 To its credit, Instant Family does tackle a variety of serious themes ranging from drug abuse to sexual abuse to racial tolerance, even if the issues are generally resolved fairly easily. An uplifting adventure apt to lead to an uptick in adoption applications. Very Good (***). Rated PG-13 for sexuality, profanity, drug references, and mature themes. Running time: 118 minutes. Production Studio: Closest to the Hole Productions. Studio: Paramount Pictures.